Police are searching for two suspects in a Sunday morning fatal shooting of a 32-year-old East San Jose woman, according to the San Jose Police Department. Officers responded to the 1900 block of Lavonne Avenue around 6:30 a.m. Sunday to find a woman suffering from at least one gunshot wound. She was transported to a local hospital, where she was later pronounced dead, police said. The woman's identity was not released by police or coroner officials as of Sunday evening, but family members told NBC Bay Area her name is Laura Garcia, and she's lived in the neighborhood most of her life. They said she was a quiet person who kept to herself. Garcia's family said the neighborhood has had problems for years and added that a lack of police patrols is part of the blame in the shooting. Garcia's slaying is the city's 40th homicide of year, police said. San Jose recorded a total of 30 homicides in 2015, according to the Mercury News. A man, identified only as Garcia's brother-in-law, also was shot at least once. His injuries were not considered life-threatening. Police said the shooting started after an argument. 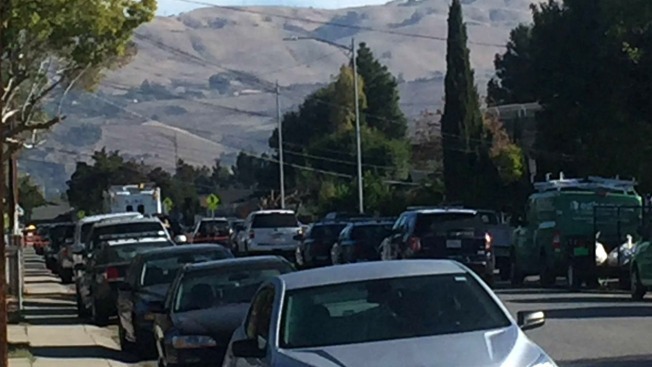 "The victims were standing outside their residence, the suspects approached on foot, there were words exchanged, and shortly after, gunshots were fired," said San Jose police Lt. Eddie Pedreira. Neighbors on Lavonne Avenue said they heard the gunshots, and two sisters who share a home heard a knock at their door shortly after. Silvia Vandenberg said she didn't dare answer the door, at the advice of her sister. "She said not to open; she just heard gunshots," Vandenberg said, adding that it was still dark, and she could not see who was at the door. Neighbors said the shooting happened outside a house party that lasted throughout the night. They also reported hearing four shots, one after the other, before a car sped away from the residence. Investigators at the scene said a motive for the shooting is not known and they have not identified or apprehended any suspects. Police are asking the public for help in identifying the shooters. Anyone with information is asked to contact the San Jose Police Department's Homicide Unit at 408-277-5283. Anonymous tips can be reported to Crime Stoppers at 408-947-7867.